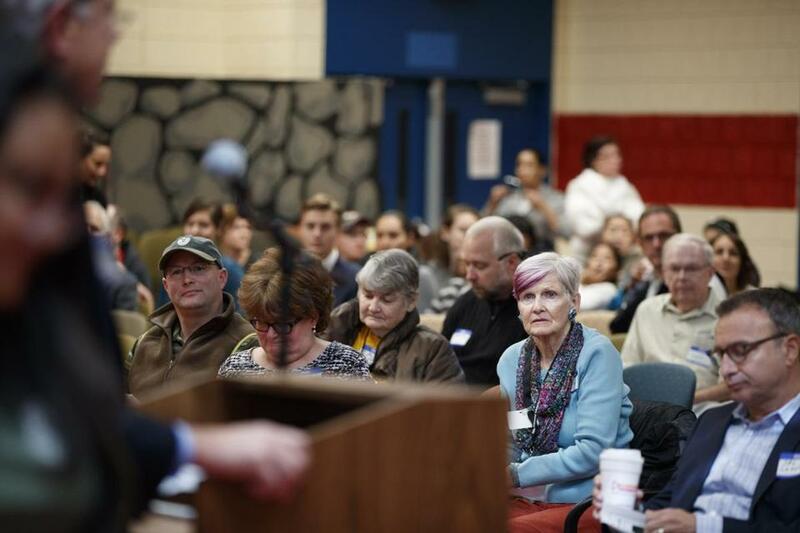 Boston-area residents were among the many people who attended East Boston&apos;s first-ever Climate Summit on Saturday. The city of Boston, which could lose up to 30 percent of its land to rising sea levels by the end of the century, unveiled plans Saturday to protect parts of East Boston and Charlestown from flooding caused by climate change. The projects call for installing a portable flood wall across the East Boston Greenway and elevating a portion of Main Street in Charlestown. While Boston has developed plans to protect stormwater systems citywide and other, largely unseen infrastructure from the effects of climate change, the projects in East Boston and Charlestown represent the first visible signs of Boston’s efforts to protect individual neighborhoods. “We’ve identified ways to try to stay ahead of some of these challenges, and now we’re making them a reality, starting in neighborhoods that are most vulnerable,” said Boston Mayor Martin J. Walsh, who announced the plans during the East Boston Climate Summit held at Mario Umana Academy in East Boston. East Boston and Charlestown were picked for the projects because the neighborhoods are among the most susceptible to damage from coastal flooding and rising sea levels, according to a 78-page report released by the city Saturday and highlighted at the summit. The East Boston project calls for putting up a 7-foot-high flood wall during threatening weather across the section of the East Boston Greenway that runs under Sumner Street. The wall would measure 30 feet long and could be deployed before storms to prevent flooding, said Nasser Brahim, a senior planner at Kleinfelder and consultant for the project. City officials say the flood wall would protect 4,300 residents, at least 70 businesses, and transportation tunnels from coastal flooding. The flood wall would be capable of withstanding water levels measuring a foot beyond what would be generated during a major storm, the report said. The flood wall takes no more than two hours to put in place and would be kept in storage during good weather, officials said. The city estimates it would cost $100,000. Similar flood walls are used to guard against flooding on property owned by the Massachusetts Port Authority and at the World Trade Center in New York City, Brahim said. The US Army Corps of Engineers has tested such walls and found them to be effective, he said. The project is in the design phase and a timeline for its completion hasn’t been set, city officials said. The Charlestown project would elevate Main Street by an average of 2 feet in front of the Schrafft’s City Center driveway. Such a change, the report said, would provide protection from water levels measuring a foot higher than what could happen during a big storm by 2030, when sea levels are projected to have risen 9 inches over current levels. The move would give cover to some 250 residents, 60 businesses, public safety facilities, and the Rutherford Avenue underpass. City officials estimate the project would cost $2 million to $3 million and would be integrated into plans to redesign Sullivan Square and Rutherford Avenue. Construction is expected to begin in 2021, the report said. The report also recommends other measures for protecting against rising sea levels, such as elevating the entrance to the East Boston Greenway and Piers Park II in East Boston and elevating the waterfront edge of Ryan Playground in Charlestown. The plans were presented in detail to hundreds of people gathered for the climate change summit, organized by Neighborhood of Affordable Housing, Inc.
“Seas are rising. East Boston is next to the sea. What could happen here?” asked Philip Giffee, the organization’s executive director. Aside from its homes and businesses, East Boston also needs to protect the highways, bridges, tunnels, subway line, and airport that sit within its borders. Scarlett Mitchell of East said she worries about flood waters encroaching on her Border Street home, which is close to the shore. Sonia Santos, 37, who also lives in East Boston, said she’s worried by what she has read about rising sea levels.